Take heed, dear Friends, to the promptings of love and truth in your hearts. 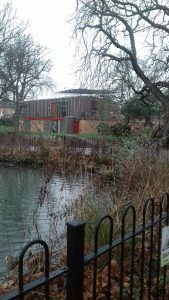 On Sunday 5th March 2017 our meeting for worship will be held in the Tennis Pavilion in Clissold Park instead of our usual room in Clissold House itself. The Tennis Pavilion is located at the bottom of the park behind the smaller pond and near the Queen Elizabeth’s Walk gate. The meeting will start as ever at 10.00am with the usual refreshments and community afterwards.